Multi-talented NYC-based jazz vocalist Sarah Partridge will make a Columbus stop on her fall tour at Natalie’s on Wednesday, December 5th at 9pm. Tickets and more info are available here. For this performance, she will be backed by an excellent trio of Columbus jazz veterans, with Roger Hines on bass, Jon Eshelman on keyboards, and Aaron Scott on drums. 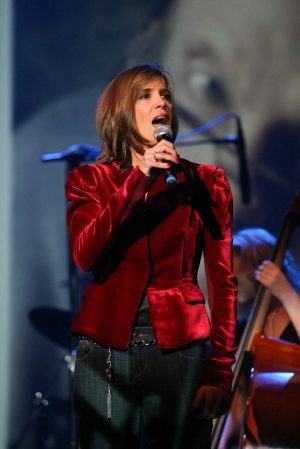 Partridge is a renowned songwriter whose six studio albums include her acclaimed 1998 debut which featured greats like Frank Wess, Bucky Pizzarelli, and Gene Bertoncini, and her most recent, a 2017 tribute to Janis Ian. Prior to her recording and touring career, she garnered success as an actor, including a feature role alongside Tom Cruise in the 1983 hit Risky Business. Partridge was kind enough to answer my questions via email – Keep reading to learn more about the concert, her music, and upcoming projects, and then come out to Natalie’s on the 5th for world-class vocal jazz. I was excited to hear about your concert at Natalie’s with an all-star Columbus trio. What material can potential concertgoers expect to hear? Sarah Partridge (SP): Since I’m not promoting any one album right now, this tour is really just about singing songs I love to sing. That means a mix of some of the great known and lesser known standards along with some original tunes that I’ve written. I will also be featuring some songs from my latest album,Bright Lights & Promises: Redefining Janis Ian. Most of the arrangements on that album are written for a larger band so I’ll only be performing a few of them. Tell me about your album Bright Lights & Promises: Redefining Janis Ian. Were there any particular challenges in interpreting Ian’s songs in a jazz style? SP: First of all, it came about with an idea of wanting to “salute” and redefine the music of an artist outside of my genre. I had met Janis through the Recording Academy and I thought….what if? I started delving into her very large body of music. There is so much more than just “At Seventeen” and “Society’s Child.” Years and years of prolific writing. Her lyrics are so deep and many of her melodies (especially her early ones) are full of jazz and blues lines. I knew this was it. To condense the story, she opened up her entire catalog to me, including songs she had never recorded. I chose some old, some new, one that had never been recorded, and we co-wrote two songs for the album. We remain good friends and colleagues. To really answer your question about challenges, the only one for me was creating that very different and personal take on someone else’s music. But as the arrangements evolved, everything fell into place. It was a joyful experience from beginning to end. What do you think about, and look forward to, when preparing for a concert tour? SP: Well…I worry a lot! What cities make sense, will people come out, will I bring my own musicians or use locals? The setting up of it is tedious but rewarding. I’m a one woman band when it comes to booking a tour so it takes quite a bit of time away from the creative life I prefer. But if you’re going to play music for a living, you have to deal with all aspects of the business. The best part is embarking on the tour, which is like a little journey where you meet all kinds of new people in a very positive experience… a concert. I think you see people at their best when they are enjoying music. It taps in to those endorphins! The audience AND the musicians are on a high. So, I love playing the music and being on stage, and giving these songs away. But the added perk is meeting new people from all over. I see that you have a strong acting resume in addition to your jazz career. How does the experience of acting in a movie compare to playing a concert? SP: I have always said that performing live is a completely different beast than performing on film. All I can say is that doing a concert is more like acting in a play or musical, except that it’s much more naked. It is just YOU up there with your band. No character to hide behind, no chorus numbers, no exiting stage left until your next scene. Recording an album is similar to acting on film. Slow going, lots of stops and starts, and room for editing. They all have their separate skill sets. Are you working on any new projects when you return from tour? SP: I am, in fact, in the very beginning stages of a new recording project. Phase one is funding…..not the fun part. Record deals are scarce, so musicians from all genres and stages of success are funding their own projects. The working title of my project is “Portraits of Wisdom.” It will be a collection of original compositions written by myself as well as some well-known jazz composers about renowned women in the STEM fields (Science, Technology, Engineering and Mathematics). I’m going as far back as the 1800’s and bringing these “musical portraits” up to the present day. It’s been fascinating to research. There are some amazing stories behind each one of these brilliant women. Writing has begun and I’m excited to see how the project develops. Do you have anything else to add about your show at Natalie’s? SP: I have been told by fellow musicians and friends who have been patrons that it really is a wonderful room to play. I’m hoping that people will come out and enjoy a great show with their own local and highly respected musicians in an atmosphere that takes them away from their day. I always feel empowered in a room with good vibe, excellent sound and lighting. Apparently, Natalie’s has all of that! Even if you’re not a jazz head, I think you’ll enjoy this show. People of all musical tastes seem to love this music. And when you work with the best musicians, everyone steps up their game…it should be an evening of fun improvisational surprises! See you all on December 5th. To learn more about Partridge, visit www.sarahpartridge.com.